Diamonds can occur in almost all colours of the spectrum, with yellow being the most common of all the fancy coloured diamonds. Although all natural fancy coloured diamonds are extremely rare, none are more so than the red diamond. Found mostly in Africa, Australia and Brazil, red diamonds are so rare that only around twenty to thirty true red diamonds are known to exist and most are less than half a carat in size. What makes a diamond red in colour? Unlike other fancy colour diamonds that derive their colour from impurities such a nitrogen and borono, red diamonds are made purely from carbon, just like colourless diamonds. The red colour of the diamond is created by a rare occurrence in its atomic structure. Find out more about how diamonds are formed. 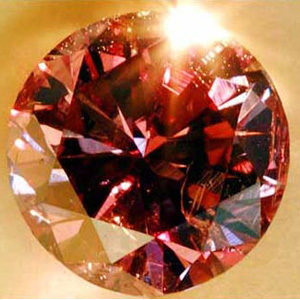 Red diamonds look different in various lighting environments. They look best in daylight and candlelight and they look worst in fluorescent light. Blue coloured diamonds display the exact opposite properties in these different lighting conditions. 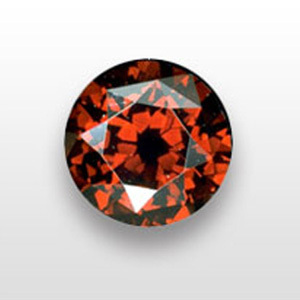 Natural fancy red diamonds are graded by the intensity of their colour and range from dark pink to purplish red. The stronger the hue, the greater the value of the diamond. The more rare a diamond is, the more desired and valuable it is. According to predictions, red diamonds will become even more rare and as a result their price is expected to double in the next couple of years. Today, the price for a natural fancy red diamond rarely starts under $100 000 (approximately R925 00) for anything above 0.20ct. 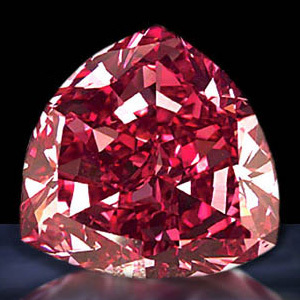 The Hancock Red Diamond is a round brilliant cut diamond weighing 0.95ct and was named after the famous collector, Warren Hancock. 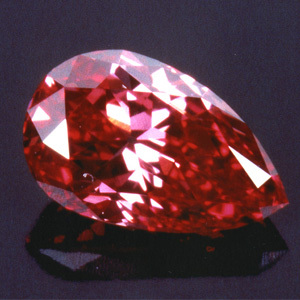 This natural fancy red diamond is not famous for its size but rather for its rare purplish red colour. In 1956, Mr. Hancock reportedly paid $13,500 (approximately R125 000) for this diamond and was sold for $880,000 (approximately R8million) in 1987. The Rob Red is a pear shaped, 0.59ct fancy red, VS1 clarity diamond. It has been described by a fancy colour expert as the most saturated and purest red diamond measured visually and instrumentally to date in the world. Originally known as the “Red Shield”, the Moussaieff Red is a triangular brilliant cut or trilliant-cut, fancy red, internally flawless (IF), 5.11ct diamond. It was discovered in the 1990s by a Brazilian farmer in the Abzetezinho River. In 2001, the Moussaieff jewellery firm acquired this diamond for $8million (approximately R74million). It’s the largest red diamond in the world today. The round brilliant cut, 2 to 5 carat, deep purple Supreme Purple Star diamond is a study in individuality. The exact colour and clarity of the diamond have not been revealed. When looking at the diamond from one angle, it appears to have a deep purple colour; however, when the diamond is rotated in the light, the colour changes to a deep to vivid purplish red.